Robert Jenkins Onderdonk (1852-1917) created this painting entitled “The Fall of the Alamo, or, Crockett’s Last Stand,” circa 1903. Currently owned by the Texas State Archives, the work depicts the artist’s impression of Davy Crockett’s efforts at the Alamo on March 6, 1836. Online via Wikimedia Commons. Houston wasted no time issuing a plea for help. Texas, as he said, was "bleeding." Houston, who came to Texas in 1832, had once been governor of Tennessee. His official residence, (as president of the Texas Republic in 1837), was hardly one becoming the leader of government. As noted in his 1839 passport, Houston was 6'2" tall. By mid-April, Texians and Tejanos desperately needed some good news. Fleeing their homes and land, as Santa Anna's forces tried to reclaim control of the territory, Houston's people came to a fork in the road. One direction would take them to Louisiana and possible refuge in the United States. The other would take them to Harrisburg and more fighting. On April 17th, they chose the road to Harrisburg. The Mexicans, still basking in their Alamo victory, had no camp guards posted. Taking an afternoon siesta, they did not realize - until it was too late - that the revolutionary army was upon them. In eighteen minutes, the fighting was over. The next day Houston, who had been injured, was resting under a tree when he saw Mexicans coming toward him. At first he thought all was lost. One of the Mexicans, dressed as a common foot soldier, had been found, hiding in the grass, by Houston's men. It was Santa Anna. In the end, Santa Anna (who tried to negotiate his freedom through a secret deal for himself with David G. Burnet, the Republic's interim president whose tenure was over in seven months), did his country much more harm than good. And his officers were incensed at his perceived cowardly conduct. Both Sam Houston and Santa Anna gave official accounts of the famous San Jacinto battle. Those accounts understandably reflect vastly different perspectives. In 1848, following the Mexican-American War, Santa Anna signed the Treaty of Guadalupe Hidalgo nine days after gold was discovered at Sutter's Mill. One is left to wonder "what might have been" had Santa Anna allowed those Goliad soldiers to actually board a New Orleans-bound ship. Who, under those circumstances, would have committed national resources to support a bunch of rag-tagged insurgents whose fortunes in Mexican Texas had gone awry? Instead, we 'Remember the Alamo,' (and the Texas Revolution) as one of the most significant turning points in North American history. And ... we remember the Alamo's defenders (both Texians and Tejanos) as courageous heroes whose efforts ultimately helped to bring peace to Texas. Bos, Carole "REMEMBER THE ALAMO" AwesomeStories.com. Mar 01, 2004. Apr 24, 2019. 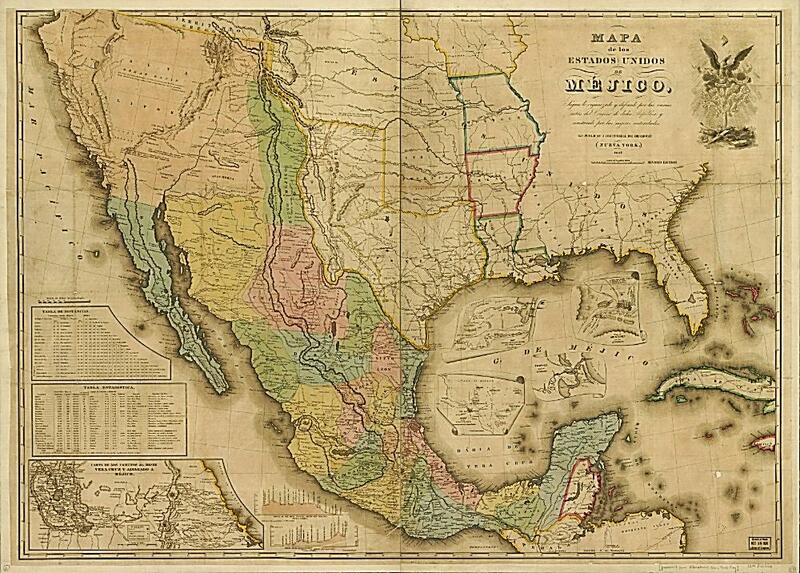 Historical Map of Texas - Annexation to the U.S.